In Rhode Island, title to real property can be transferred from one party to another by recording a warranty deed. A warranty deed conveys an interest in real property to the named grantee with full warranties of title. 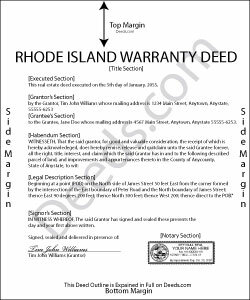 Warranty deeds are statutory in Rhode Island under R.I.G.L. 34-11-15, and they convey real property in fee simple with the most assurance of title. When the words "with warranty covenants" are included in the conveyancing clause, the following covenants are implied: the grantor guarantees that he or she holds title to the property and has good right to convey it; that the property is free from encumbrances (with the exception of any noted in the deed); and that the grantor will defend the title against all claims (R.I.G.L. 34-11-16). This warranty of title is greater than that of a limited or special warranty deed, which guarantees the title only against claims that arose during the time the grantor held title to the property, or a quitclaim deed, which offers no warranties of title. A lawful warranty deed includes the grantor's full name, mailing address, and marital status; the consideration given for the transfer; and the grantee's full name, mailing address, marital status, and vesting. Vesting describes how the grantee holds title to the property. Generally, real property is owned in either sole ownership or in co-ownership. For Rhode Island residential property, the primary methods for holding title are tenancy in common, joint tenancy, and tenancy by entirety. A conveyance of real estate to two or more persons creates a tenancy in common, unless otherwise specified in the conveyance (R.I.G.L. 34-3-1). As with any conveyance of realty, a warranty deed requires a complete legal description of the parcel. Recite the prior deed reference to maintain a clear chain of title, and detail any restrictions associated with the property. Finally, the form must meet all state and local standards for recorded documents. The completed deed must be signed by the grantor (and his or her spouse, if applicable) in the presence of a notary. The grantor must indicate his or her residency status on the face of the deed. A residency affidavit, completed by the grantor, is required for sales of realty by nonresidents. Transfers by nonresidents are subject to withholding of a percentage of the total payment by the grantee/buyer. Buyers may only depend on the seller's residency status by receipt of an affidavit of residency. For more on withholding of Rhode Island tax, see R.I.G.L. 44-30-71.3, and consult a lawyer with questions. Rhode Island levies a Real Estate Conveyance Tax based on the consideration paid (R.I.G.L. 44-25-1(a)). This tax is due upon recording. If there is no consideration paid, the deed must include a statement to the effect that "the consideration is such that no documentary stamps are required" (R.I.G.L. 44-25-1(b)). If the transfer is exempt from the Real Estate Conveyance Tax, state the reason on the face of the deed. See R.I.G.L. 44-25-2 for a list of exemptions. A completed Form CVYT-1 (Real Estate Conveyance Tax return) is required for all transfers of real property, and should be submitted to the Rhode Island Division of Taxation. Record the original completed deed, along with any additional materials, at the city or town clerk's office in the municipality where the property is located. (Rhode Island records at the municipal level.) Contact the same office to verify accepted forms of payment. This article is provided for informational purposes only and is not a substitute for the advice of an attorney. Contact a lawyer with questions about statutory warranty deeds, or for any other issue related to the transfer of real property Rhode Island.